The Maria Island Zone (between Cape Forestier and Marion Bay) will remain closed when the east coast rock lobster season opening occurs on 8 December for the recreational fishery and 11 December 2018 for the commercial fishery. Results from rock lobster samples collected from this Zone on 20 November show that biotoxins remain at unacceptable levels – above the regulatory limits. Although biotoxin levels detected in sentinel mussel samples along the east coast have been at negligible levels for some time, PST levels in lobster in the Maria Island Zone have not declined to within the regulatory limits from the harmful algal bloom (HAB) in that Zone during the closed season. 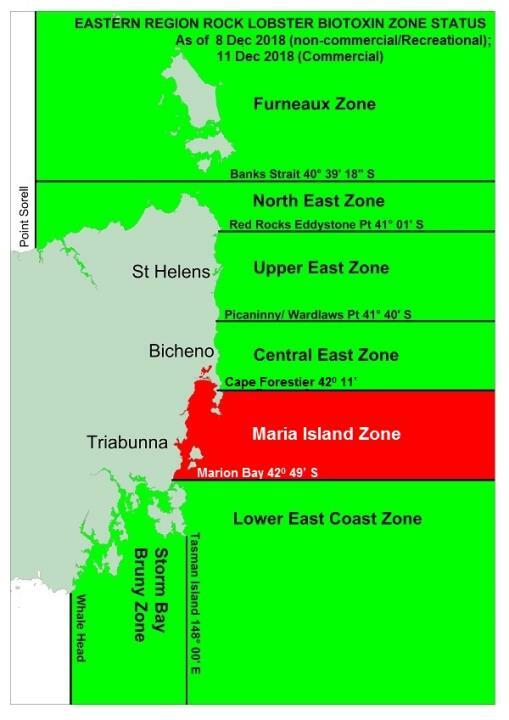 The Maria Island Zone will remain closed until biotoxin levels are below the prescribed levels. Additional sampling will be undertaken and a decision on the open/closed status for this zone will be made just prior to the weekends of 15/16 December and if necessary 22/23 December.